It's that time again, folks. That's right, Award Show season!!! 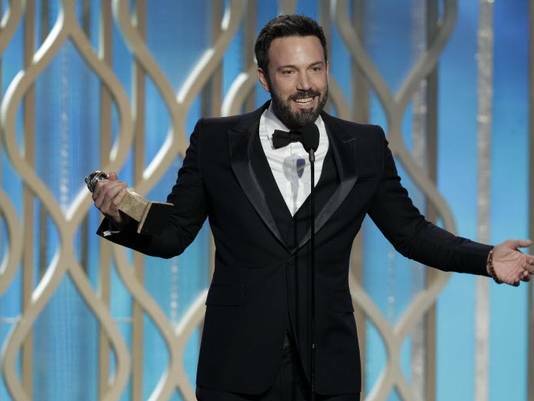 Not only is the team here at Sequence working on an array of trophy-hocking celebrations, but the entire world is preparing for the most anticipated night of the year, the Oscars. The pre-game shows, also known as "The Golden Globes" and the "Grammy's" whet our appetites. This post is part 1 of a 3-part mini series by me, the self-proclaimed "Sofa Show Producer". I'm calling it like I see it from the safety of my own couch, no headset or clipboard required. Phew! And now . . . the show begins! Or, actually, the E! red carpet coverage begins . . . all in the name of show-production science, people! If you're going to "red carpet," E! really has it down. Plus, they are all actually dorks to the core and are clearly having a good time out there. Live TV is a land I have never visited, but hope to some day. No safety net, maximum pressure, and an audience beyond the confines of the venue. When I'm watching, the production blips make my heart stop "Let's talk a look at that dress . . . any minute now . . . it's red . . . you'll really like it . . . still waiting . . . voila, there it is!" All the while, I'm breathing into a paper bag! Ok, now, the show really begins!!! I can't wait to see the stage . . . [adjusts her floor-length designer gown, champagne and popcorn *POPPED*, remote at the ready]. Anniversary would have garnered something a little more interesting. Let's see if it grows on us! Hostesses with the Mostess: Tina and Amy (yes, we're on a first-namebasis), are HIL-A-RIOUS! Genuine and booming laughter from the audience, music to any Producer's ears. I was myself LOL-ing from the sofa. STAGE SET UPDATE: I like the color changing wavy-shapes on the stage . . . best colors so far are the white and the amber golds. Production-wise the Golden Globes pretty straightforward. There are SO MANY awards to get through so it makes sense to keep it simple. The animated graphics also typically stay similar year-to-year (kind of a Golden Compass look). HUGE SNAFU ALERT!!!!! Selma Hayek and Paul Rudd left standing like doofuses during what must have been a promoter malfunction during "Best Actor in a TV or Mini Series"?!? They cut to the nominee reel, probably the smartest thing to do. AWK-WARD. Tech Geek Side Note: Where do you get one of those AWESOME adjustable microphones that pop up out of the stage and adjust in height for each speaker?! That's a gadget you could have some fun with in the booth! Need it. Tsk Tsk: Clearly whoever rehearsed with Tony Mendez (who introduced the film inspired by his real life mission, Argo), did not coach him to speak directly into the mic. THIS JUST IN on decor (thanks Faye!) . . . tasteful red centerpieces, variations in flower type and height. Just the right amount of punch to enhance the room. Disguised! 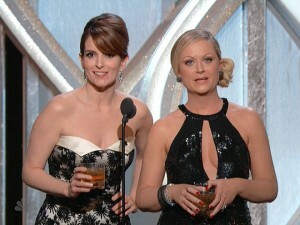 I thought it was really brave that they allowed Tina and Amy to make cameos as nominees in ridiculous costumes. Could really have rubbed people the wrong way, but was cute and funny in their execution. These ladies really know how to toe the line. Biggest Surprise Presenter: What?!?! Bill Clinton is in the house?!?! Amazing!!! GENIUS idea for introduction to Lincoln. From the looks on everyone's faces, they were all totally shocked. BEST. NOMINEE. PRESENTATION. EVER = Will Ferrel and Kristen Wiig. Worth the extra 6 minutes it added to the show, FOR SURE!!! STAGE SET UPDATE: Now, there are circles?! Apparently the background has been changing all along, and I didn't actually notice it until now. I guess that means it was a little too subtle, eh? Unpredictable: Do the Producer's hold their breath when a loose canons like Sasha Baron Cohen and Aziz Ansari take the stage to present? You can't even control them with wrap-up music because you still need them to serve a vital function for the show. Scary! Staffing Side Note: How does one get the job of "Dude who helps the ladies up the stairs"? Tweetable: In case you missed it "The Flu" was the unofficial winner of the night with the most mentions. Wrap It Up: I know this is not unique to the Golden Globes, but it just doesn't seem fair how aggressive they get at the end with the wrap-up music. Isn't there a better way?!?! These are the biggest awards of the night, people! Are the means really worth the on-time end? I guess the people have parties to get to. 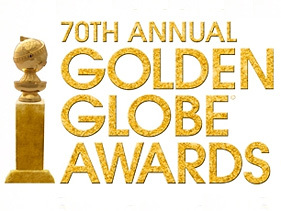 Overall, I found the 70th Annual Golden Globes very enjoyable. Seemed like there was a little more (good) comedy than usual, plenty of heartfelt and touching moments, and the production was mostly smooth sailing. Thanks for reading! See you again on Sunday, February 10th for the Grammy's!